When I originally found this recipe on Peppers.com I was instantly wary. 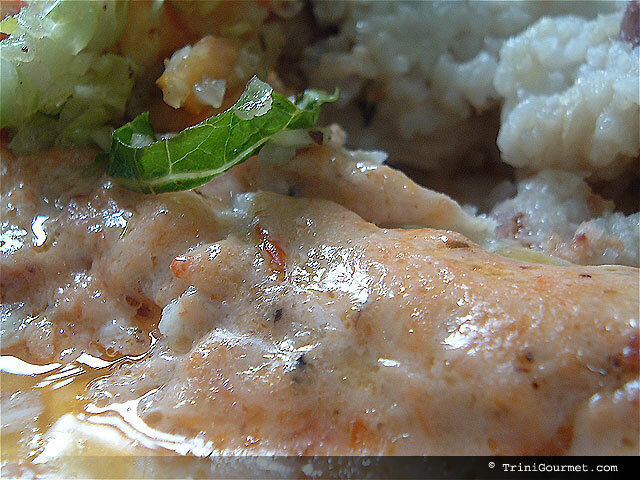 You see I keep stumbling across recipes that begin with the word Trinidad or Caribbean that then go on to have little resemblance either through ingredients or methodology to what I’m familiar with. 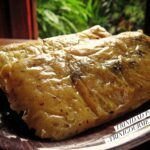 So when I clicked on this recipe titled ‘Trinidad Hot Baked Fish’ I was pleasantly surprised to see that it passed the very first ‘authenticity test’ to which it was posed. So what was that test? Well once a recipe has fish or chicken in it, if it’s presuming to be Trinidadian I instantly expect to see that the first treatment the flesh will be subjected to is a treatment of lime or vinegar. And there it was. The squeezing of the lime. This was the real deal! I could move on 🙂 This dish was very simple and economical, and even better it pleased the palates of my parents who have very divergent benchmarks of appreciation. 😀 I made very few changes besides substituting cheddar cheese for the Parmesan (much more affordable, and infinitely more ‘Trini’), and I also adjusted the baking times because the ones on the site weren’t working for me. 1. Place rack in center of oven. Preheat oven to 425 degrees. 2. Blend all ingredients, except fish and lime, together. 4. Butter bottom of baking dish. 5. Place fish fillets in baking dish. 6. Squeeze lime juice over fish. 7. Salt, pepper, and sprinkle fish with your favorite dry spice mix (mine is ras-al-hanout, maggi fish seasoning would be good too!). 8. Broil fish for 7-10 minutes depending on thickness. 9. Pull fish out of oven and place Pepper Sauce mixture over fish. 10. Broil 3-5 minutes or until lightly browned!